A demonstrator holds a poster of Marwa El-Sherbini at a protest in Istanbul. Berlin, Germany (CNN) -- A German man accused of stabbing to death a pregnant Muslim woman in a Dresden courtroom went on trial Monday -- in the same court and amid tight security. The defendant -- a 29-year-old unemployed ethnic Russian -- is accused of stabbing Marwa El-Sherbini 18 times in front of her 3-year-old son during a defamation hearing in the court in July. As the trial got under way, he entered in a hooded top and sunglasses, which the judge asked him to remove, fining him €50 ($70) when he kept the glasses on, according to Agence France-Presse. Prosecution lawyer Frank Heinrich told the court that the defendant had stabbed Sherbini "out of pure hatred against non-Europeans and Muslims", AFP reported. "He wanted to annihilate them," he said. 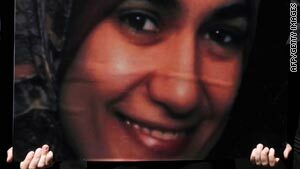 The killing of Sherbini, a pharmacist who was three months pregnant, stirred outrage in the Muslim world, especially in her native Egypt. Many accused Germany of lax security and for not adequately protecting its minority Muslim population from a new wave of hatred against Arabs. Sherbini moved to Dresden in 2003 after the husband received a grant to study genetic engineering in the Max Planck Institute. He was scheduled to present his doctoral thesis when Sherbini was killed. The case stemmed from an incident in August 2008 at a public playground when Sherbini asked the man to move his niece from a swing so her son Mustafa could use it. The man responded by calling Sherbini -- who wore a headscarf -- "terrorist" and "Islamist," prosecutors said. Sherbini, 33, sued him for insult and abuse. A court found the man guilty of defamation and fined him €780 ($1,172). Alex W. appealed the ruling. The two sides appeared in court again on July 1. After Sherbini had finished testifying, the man allegedly pulled out a knife from his backpack and attacked her. He also allegedly stabbed her husband three times and attacked another person. According to media reports, police officers tried to intervene to end the fight, and a number of shots were fired. One hit the husband, sending him to a hospital where he lay in a coma for two days. Anger in the Arab world was fanned by the muted German reaction soon after the incident. The country's media perfunctorily reported on the incident and did not touch upon the racist aspect of the killing. Egyptians held up the response as a sign of Islamophobia. Hundreds attended Sherbini's funeral in her hometown of Alexandria in Egypt, and Muslims also angrily protested in Berlin. The Egyptian culture ministry, at the request of the Sherbini family, has canceled two previously scheduled concerts by a German orchestra this week. The head of the Egyptian Bar Association will attend the trial, as will the Egyptian ambassador to Berlin. Husam Zaki, a spokesman for Egypt's foreign ministry, said the country has hired a group of "highly qualified legal experts" to act as co-plaintiffs in the trial and will foot their expenses.